Last Fall we announced that my brother Manuel would be releasing his new book in 2017. 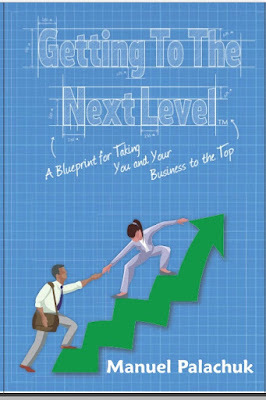 We are now shipping Getting to the Next Level: A Blueprint for Taking You and Your Business to the Top! in Hardbound or PDF at SMBBooks. Learn to design your business from the top down using the Pyramid of Purpose and Value and then build it from the ground up by leveraging Business Agile Strategy Execution (BASE). Your Shared Vision is the heart of your business even more so than your product and service value proposition. Your shared vision must be embedded in your organizations culture so it can permeate all the way down to the ground level. The Pyramid of Purpose and Value allows you to design your business from the top down and to share it in a meaningful way. It paints a clear and enticing picture and tells a very compelling story of how you intend to create stratospheric success. It attracts the right people to back your endeavor and the right people to get on board. You ability to define a clear business roadmap & Strategy and then execute on it is one of the biggest determinants of your success. Imagine taking the most advanced methods of Agile development and applying them to your business roadmap & strategy execution. That's Business Agile Strategy Execution. BASE is the most innovative advancement for small and medium size business roadmap development and strategy execution and you can harness and leverage its power for your self. The entire process is clearly defined and broken down in step-by-step fashion using real life examples. Today more than ever there is a demand for value in everything we create or do. Tap into the authors insights on creating a value proposition for your customers that endears them to your business because they see you are a value drive organization. Learn about the elements of success that determine your organizations overall Business Maturity Index and how to drive them in the direction you want. 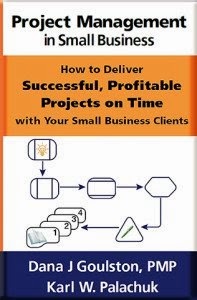 With this book you will have the most important component of a true significant competitive advantage for your business, the blueprint for success. 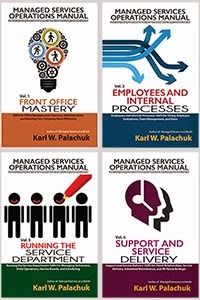 About the author: Manuel Palachuk is the coach who will take you to the gym not just send you there. He believes that small business is the backbone of the world and the service industry in particular is the heart! He has nearly 30 years of business, management and training experience in the computer and electronics industries including owning and managing successful IT and MSP companies. He holds an Associate degree in Electrical Engineering Technology and a Bachelor’s degree in Automated Manufacturing Technology. He is an expert of process, systems, and their efficiency who is driven toward continuous improvement in all aspects of business.